MONTREAL—Those who hear and see Shen Yun Performing Arts on stages around the world normally gush with praise, but it is especially so for those skilled in dance and music. Experts who understand the mastery involved in the performance tend to be especially profuse in their acclaim. So it was at Place des Arts on Jan. 8 when one of Bulgaria’s great musical experts sang the virtues of the orchestra and the dancers of Shen Yun. Vania Angelova is officially counted among the “Who is Who in Bulgaria” with her own encyclopedia entry. She has a long list of awards, accolades and accomplishments including a medal from the Ministry of Culture of the Republic of Bulgaria. She is a professor of composition, piano and singing and has performed in Holland, Austria, Ukraine, Italy, Germany, Russia, Bulgaria and Canada, and on radio and TV. Her compositions have been interpreted by the Philharmonic Orchestra of Ukraine, Chapella National of Bulgaria, chamber orchestras and choirs in Europe and Canada. 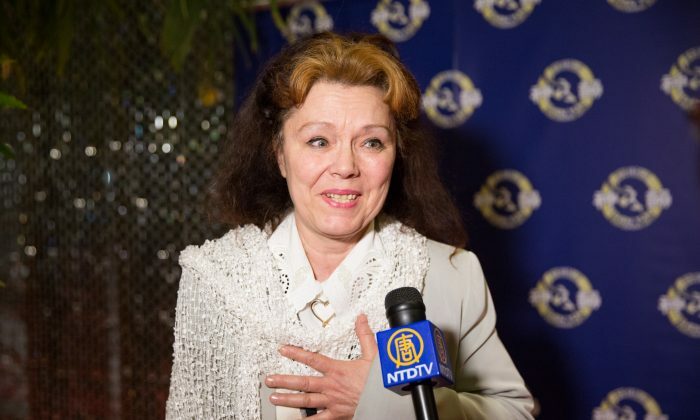 As one of Bulgaria’s elite composers, it is not a surprise she is friends with another, Maestro Kiril Tarpov, conductor of the Shen Yun Orchestra. “He’s a very good friend of mine and a very renowned international conductor,” she said. Even knowing the talent of her friend had not prepared her for the performance she saw that night, she said. “I’m a little shocked even, I was crying several times. For me this is a wonderful, fantastic spectacle. Such wonderful and unique dancers and musicians,” she said. Watching Shen Yun was like being in a fairy tale, she said. She credited the cast for the evening she was having and paid special thanks to her friend, Maestro Kiril Tarpov. The Shen Yun Orchestra has a Western symphony as its foundation with Chinese instruments like the erhu, pipa and suona leading the melodies. It’s a unique combination that aims to restore the heritage of ancient Chinese melodies while blazing a new path in the world of classical music. Ms. Angelova was effusive in complimenting what Shen Yun’s musicians and conductor had achieved. “For a professional musician like me, this is my life, I want to tell you that everything was perfect. I was listening to everything: the movement of phrases, the music, everything was perfect. She said that music of any style demands respect when it is done so professionally. “Bravo for the orchestra, bravo for the music, bravo for the dancers, bravo and congratulations to all people who work under this spectacle,” she said. It wasn’t just the music that impressed her, but also the digitally projected backdrops that accompanied the Shen Yun dancers. Shen Yun was founded in 2006 on a mission to revive 5,000 years of divinely inspired Chinese culture. It is a heritage that has been repressed and largely destroyed in China after the Chinese Communist Party took power there some 65 years ago. For Ms. Angelova who has an interest in Chinese culture—she described Chinese students as especially disciplined—there was a pleasure in seeing the true culture of China on stage. Shen Yun was “Beautiful, amazing,” she said. New York-based Shen Yun Performing Arts has four touring companies that perform around the world. The Shen Yun International Company will perform in Montreal until Sunday. For more information, visit ShenYunPerformingArts.org.